A book that gets mass accolades fails to make a mark on you? A book that you are so-looking- forward- to- read dissappoints you? It has happened with me again. Last time when I had said this, it was about Eat Pray and Love. 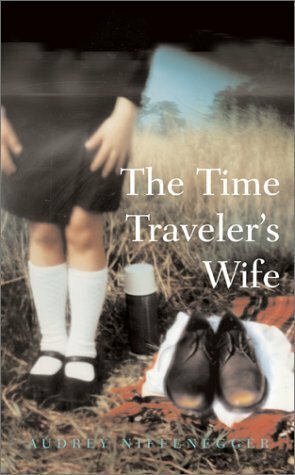 Yes, I am saying I did not like The Time Traveler's Wife by Audrey Niffeneger. It is the first book of the author I have read. Most of you may differ from me in your opinion about this book. But, let me tell you why it did not work for me and I abondened reading it after 150 pages. The novel chronicles the love story of Henry and Clare. Henry has a rare genetic disorder, which comes to be known as Chrono-Displacement, that causes him to involuntarily travel through time. He does not have control over where he travels, why he travels, when he travels and he does not take any thing from the present to which ever time he travels, not even his clothes. Actually, I found the whole premises of the story very confusing. The story is being told by both Henry and Clare alternately in first person. Henry would pop up in certain time before or after his present and meet Clare who would either be a child or much older. He would talk about their future or his past and then again he would vanish in thin air. What I found rather funny was he could travels in time and meet his other self, younger or older. That is why I felt the story was not growing and it seemed to me very flat and stagnant (till the point I read). Another probable reason I think for not liking this book is perhaps I was reading this book very slowly in bits and gave more time and attention to the other books I had been reading. By the time I reached a length in the story, I almost forgot what I had read before. I had brought the book from the library and it had been with me for at least 3 months. I kept hoping that at some point I might find it interesting. But, give it to my lazy reading, I finally returned it without even completing it. For the rest of the story I read this article on Wikipedia and some reviews on GoodReads and realised there are a whole lot of people who felt the same about the novel. What a shame this did not work for you, I find it impossible to read more than one book at a time. As you mention one like this needed concentration to fully appreciate.